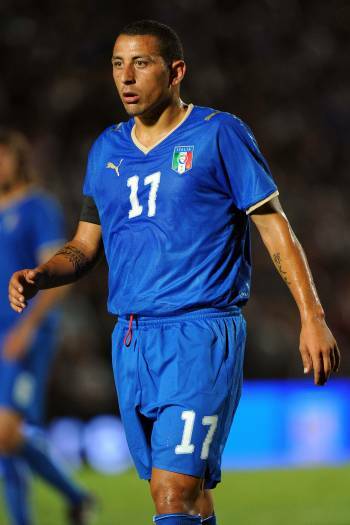 World Cup Rumours: Italy Midfielder Angelo Palombo To Be Used As Reserve ‘Keeper? Italy could be forced to employ defensive midfielder Angelo Palombo as an auxiliary goalkeeper should injuries befall both Federico Marchetti and Morgan De Sanctis the way it befell first-choice stopper Gianluigi Buffon. The 32-year-old Juventus man suffered a herniated disc in his back (as well as the flaring-up of a long-standing sciatic nerve problem) during the first-half of the Azzurri’s opening World Cup game against Paraguay and, as a result looks almost certain to miss the rest of the tournament. Marchetti will stand in for Buffon, with De Sanctis providing experienced back-up but should the merda hit the fan, coach Marcello Lippi (who has obviously been taking tips off the North Koreans) will turn to Sampdoria anchor man Palombo to fill the void left betwixt the Italian’s sticks. To be fair, this may be complete and utter hogwash – but it’s mildly entertaining hogwash non-the-less! The Football Supporters Federation has teamed up with the “Back the Pub” campaign to ensure England fans don’t get hit with massive beer tax rises this world cup. So, while England are in South Africa, at home we’ll be trying to stop the Chancellor from increasing the tax on beer in his emergency budget on the 22nd June. Hopefully if this is true, this means an early exit for the Italians. @ mizman – wierd, he was absolutely epic on FM09 or 10, but ive never seen anything of note in real life. I watch ALOT of footie.